The colon capsule endoscopy is a new endoscopic technique. 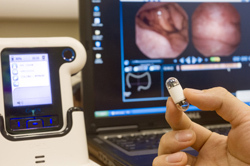 Through a pill-sized capsule with cameras on both ends and a small data recorder, medical staff can view the inner wall of the colon This examination time is usually within 9 hours, it will then be naturally passed out during bowel opening. This examination is accurate, simple, safe, low-invasive and also require no sedatives. Subjects’ discomfort and inconvenience can be effectively minimized. In order to ensure a clear image of the inner wall of colon, subjects have to follow the instructions to have bowel preparation in advance.